People are basically going bananas. What set them off (this time) happens to be a twenty-five chapter novel by John Green titled The Fault in Our Stars. Its hype is on steroids. and posts about the wonderful qualities of Augustus Waters are suffocating Facebook. The reasons we are all so star-struck by this book with a die-hard cult following are not what one might think, however. 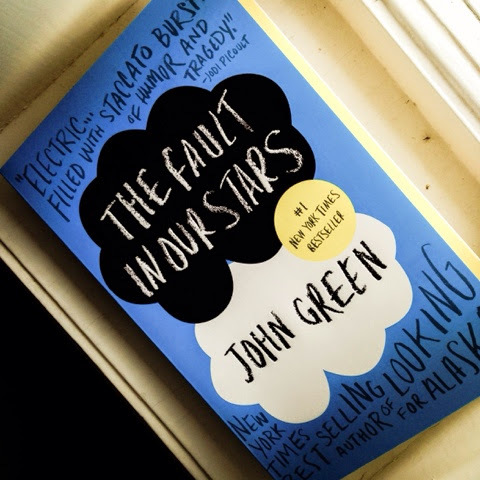 Yes, tall-dark-and-hansom Augustus Waters and his well-timed intellectual metaphors may appear to be what pulls helpless victims in, but hidden galaxies exist beyond the faulty stars. What's the real reason you love The Fault in Our Stars? Augustus was a little obsessed with both oblivion and heroism; even if people are continually forgotten, he so deeply yearned to make a mark on this world. Hazel, however, urges Gus to forget about the hopelessness of oblivion, so to speak, and to be satisfied with the good in his life - he had her, their little infinity, and their forever within the numbered days; he had his family; he had his friends. Is there, then, is a balance of these two opinions? Augustus and Hazel Grace, both, paint a lesson onto the canvas of our minds: Never stop striving to be a hero who feels. We may not be able to cure the world's illness completely, but neither are we to sit around and watch it deteriorate. Neither are we, however, to get so lost in keeping it from deteriorating that we become blind to the beauty around us. We can both love heroically creating good while loving the good around us. I could insert any number of quotes here which is precisely the point: Augustus Waters is a deep character whose mind is like a well filled with water where he ponders many reflections. Some of our drastic pull to Augustus stems from this: We long for a deeper life: deeper conversations, a deeper wondering about the world, deeper experiences with the people we love. Usually big words, random deep thoughts, and weird quirks are categorized as nerdy and slightly bizarre, but a place deep within us is so greatly parched because causal conversations and shallow relationships don't reach its depth. Sometimes, we need to embrace more of who we are: our weird fetishes, our quirky observations, our strange habits and dare to be deep ourselves. Then, we'll simultaneously find ourselves filling the deep places in others. 3. When We Don't Have the Answers: Okay? Okay. People get cancer and die young. Parents have to deal with that heartache the rest of their lives. Friends go blind, and people fail us. Words can be wielded to leave scars. and, sometimes, the world seems like one ginormous, answer-less mess. Hating the answer-less mess, we can slowly have the life in us drained through the holes left from the pain. Some answers may never be apparent, frankly, so what are we to do? Sometimes we simply have to accept that we may not know everything, but that's okay. There are things that we do know, and that is what we must choose to hold on to. We know that relationships are beautiful despite their broken tendencies. We know that laughter is like a balm placed on the scars left from living. We know that tears act as a cleaning agent to clear the way for new things. We know that long walks at dusk let us feel the blessed, cool oxygen fill our lungs. We know that the world keeps spinning. We know that our God is good, and, ultimately, that alone is enough. We must accept the reassurance of the simple things, the small healing bursts in the world's atmosphere of pain, okay? Alright, I don't mean this exactly literally. Please, don't read the above line and go egg someone's car or knock on a random blind person's door and ask to play their video games. Just bear with me for a moment, here. Life (as you undoubtedly have experienced) can be strangely stretching, challenging, painful, and unexpected. Some things life gives us we cannot fully control - we aren't in full control of the city we live in, how much bosses pay us, what our families are going to say to us, or how the weather is going to be tomorrow morning, for example. Some things life gives us are more difficult to handle than others - that untimely sickness, the sudden death of your close friend, the loss of a job. When those times come, we need to do what we can where we can to keep living a life that finds joy and laughter despite the pain. Augustus, Isaac, and Hazel chose to egg a car (not recommended), but a part of their action's essence is that they found a way to keep living despite the pain, and the way they found was filled with laughter and memory making with those who love them and who they love to love. When Isaac had surgery and became blind, he altered his life-style a little; he went from playing normal video games to ones specifically designed for the seeing-impaired. He didn't let his pain immobilize him but found ways to keep living a life filled with joy as he continued to laugh while playing with Hazel. We can always choose to laugh and love instead of being shut down by pain. "It's a metaphor, see: You put the killing thing right between your teeth, but you don't give it the power to do its killing" (Augustus Waters). The metaphors of Augustus Waters implanted themselves in millions of minds, and we - the readers - are unknowingly left in love: in love with metaphors themselves. Why, though? Words have power, and, sometimes, we need a little broader perspective. Words are like swords: they can be used as tools to defend or as tools to destroy. Words can be like cloth that wipes dirt away the window of our minds to give a new perspective on the landscape. The new perspective can amaze us and make life a little more bearable. All we really need to do is listen to these words and choose to see through the broadened perspective. "It's all fragile and fleeting, dear reader, but with this swing set, you child(ren) will be introduced to the ups and downs of human life gently and safely, and may also learn the most important lesson of all: No matter how hard you kick, no matter how high you get, you can't go all the way around." Hazel and Augustus see the lonely swing-set and are depressed, frankly. it looked lonely and slightly useless while reminding of days gone by. I couldn't help but think many of us have these"swing-sets" in our lives. We have reminders of days gone by, monoliths of our past which simultaneously make our future look pretty bleak, too. Hazel and Augustus didn't just look at the swing-set, though; they choose to take a depressing reminder and act so that good could come from the sadness. The swing-set was able to go to kids who had a purpose for it. Maybe we need to face those reminders of the past - pleasant reminders or unpleasant - and infuse joy into barren situations and find new purposes. We can find ways to bring new life into stagnant places. For everything about Hazel Grace that just wasn't normal - having cancer young, having an unusual education situation, having both a blind friend and a friend with a prosthetic leg, having an oxygen tank for a companion - John Green presented such a real character in her. She forgot to brush her hair. She ran out of time to change and proceeded to leave the house in her pajama pants. She didn't have the answers. She got a little attached to book characters. However, she still was loveable - not only to Augustus but to literally millions of readers. I think this blares a message: Nobody's perfect. No one has it all together. Maybe our humanness shouldn't need be hidden or excused but accepted. Self-standards of un-reachable perfection are ridiculous. We may find ourselves much more happy if we learn to roll with (and laugh at) our imperfect selves, not taking ourselves to seriously but just living anyway - pjs, un-brushed hair, oxygen tank, and all. 8. Just Find the Real Story. Seriously. "'So what's your story?' he asked ... 'I already told you my story. I was diagnosed when -' 'No, not your cancer story. Your story. Interest, hobbies, passions, weird fetishes, etcetra.'" Augustus and Hazel were having a conversion covering the getting-to-know-you basics, when Augustus drops the above question. He cut through small-talking fluff to the heart of the other person. Why shouldn't we do the same? Life is short as these two kids exemplify. Why only exist on levels of shallow conversations and just as shallow relationships? People are people and everyone is fascinatingly unique. Life is so short, so shouldn't we get to know not only about people, but actually know people? "I'm on a roller coaster that only goes up, my friend" (Augustus Waters). At certain moments in life, two choices present themselves: laugh or cry. Just as Hazel goes to a support group she doesn't really feel gives that much support and Augustus's house is plastered with sayings that often feel trite, both of them gained from the very things that have a tendency to drive them crazy. Hazel has a key relationship with Issac from support group, and the Augustus & Hazel relationship started there. Those sayings were influencing Augustus more than he realized sometimes. For us, too, the very things that seem so pointlessly annoying at times might very well be what infuse our lives with just what we need. "I'm a grenade and at some point I'm going to blow up and I would like to minimize the causalities, okay?" "You don't get to choose if you get hurt in this world...but you do have some say in who hurts you." "That's the thing about pain. It demands to be felt." If you decide to keep feeling as you live, you're going to get hurt. We have the choice to get close or to remain closed. Closed - we will be safe from the dirty and the heartache, but we also will be shut out from the beautifully messy and the amazingly real life where we feel the wind on our faces and the sun on out backs even though the wind sometimes stings and the sun sometimes burns. You're going to feel the pain, but you can choose to not let pain be all you feel - goodness is out there, love is real, and happiness is contagious. Will you be closed or close, then? What a sneakily enigmatic book, right?